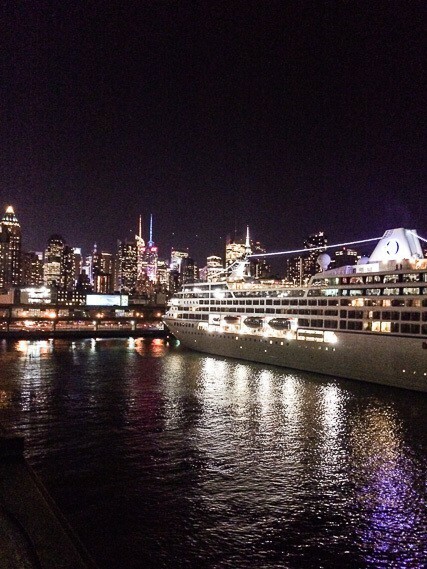 Home » Travel » NYC Wine & Food Festival: A Recap! 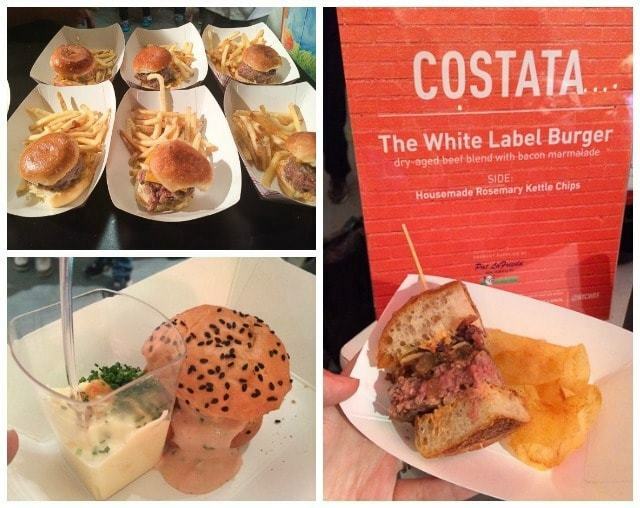 NYC Wine & Food Festival: A Recap! I have wanted to go to the Food Network NYC Wine & Food Festival for a couple years now, and last Friday I finally got to go! And it was just my luck that the venue happened to be a short walk from my apartment, because after indulging in a ridiculous number of burgers (they were all SO good! ), I retreated to my couch and plopped down in mouth-happy bliss. As expected, the food was insanely good, and the event was a blast. I’m so happy I got to attend. Here is my recap! 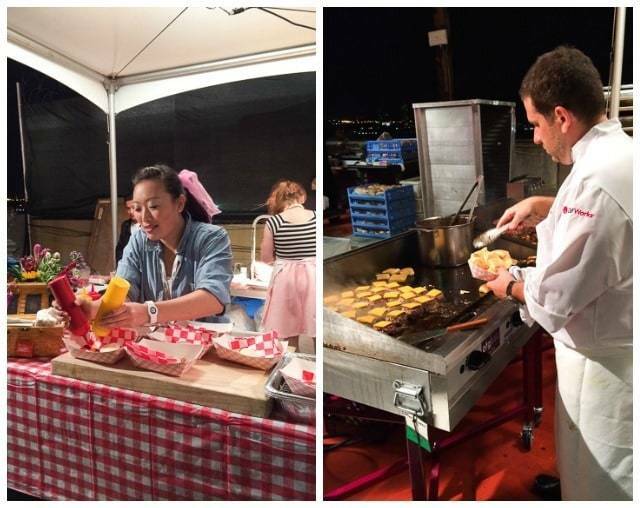 If you’ve never heard of the NYCWFF event, it brings together chefs and food lovers for food-themed parties, and while these events are delicious and lots of fun, it’s also for a good cause. The festival benefits the hunger-relief programs of Share Our Strength’s No Kid Hungry® campaign and the Food Bank For New York City. They have raised over $7 million to date, and 100% of the net proceeds from the Festival go directly to those organizations. Isn’t that amazing? 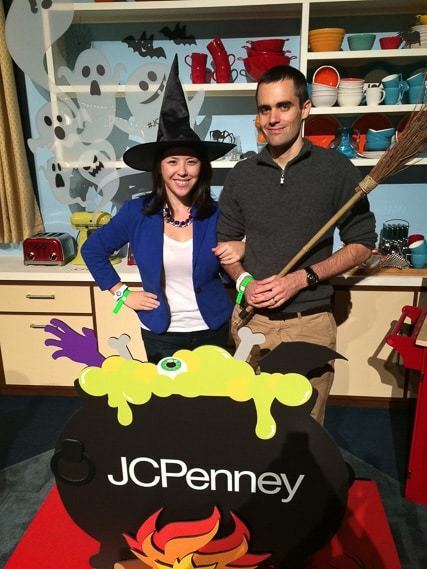 JCPenney was one of the sponsors for this year’s event and they asked if I wanted to attend the Burger Bash hosted by Rachael Ray and share my experience. Um, YES! Pete and I walked up to the rooftop and were greeted by the view above. We were lucky it was a gorgeous night out and the city was sparkling. It was such a gorgeous setting! The view didn’t keep us for too long though…we were ready to eat! We started hitting up the burger stands to chow down. I mean look at this…dry-aged burger with creamed spinach bites on the side. You bit into the crispy shell and inside was cheesy, creamy spinach. I don’t even know how they did it. Beyond the food, I was also really excited to see so many Food Network personalities at the event cooking for us! 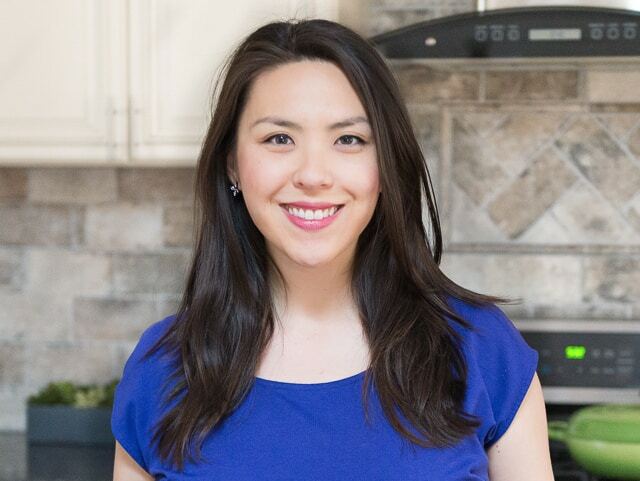 It’s great to see these TV personalities out cooking their food and showing us their talent. 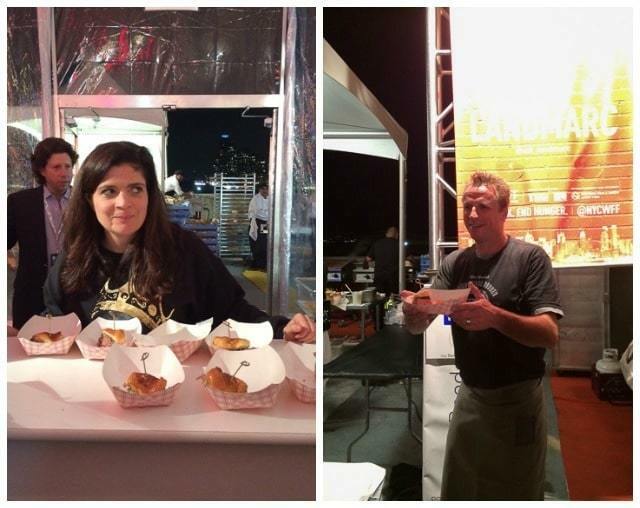 I’m a big fan of Alex Guarnaschelli (above, left), and also of Marc Murphy (above, right), who ended up winning the Judge’s pick for Best Burger (he made a spiced ground lamb burger with mint chimichurri, with homemade kettle chips on the side). After filling up on quite a few burgers, Pete and I went to the JCPenney lounge to relax for a bit (and by relax, I mostly mean stop eating burgers for a little while, haha). 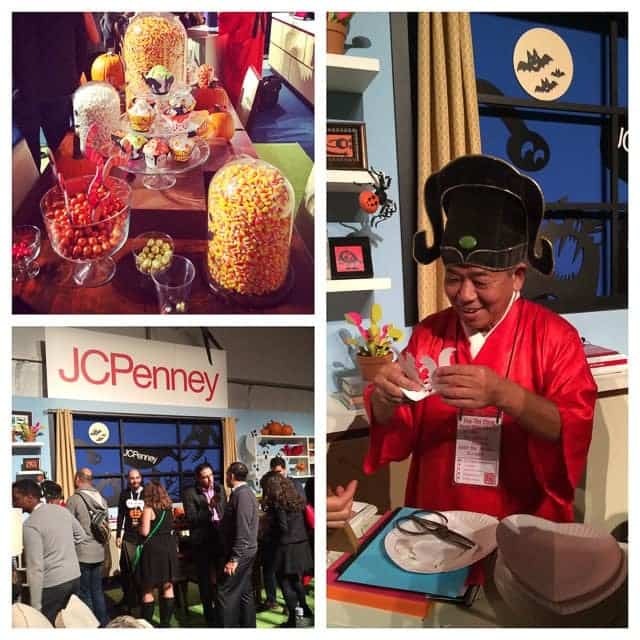 The JCPenney lounge was beautifully decorated, decked out in a Halloween theme! I’ve never shared this before, but I really love interior design, so it was awesome to see how they made the lounge feel really fun, with contemporary furniture and bright colors. They had tablescapes with Halloween candy and paper cutouts, and they also had this amazing Chinese Paper-cutting artist named Mr. Cheng who cut intricate designs from paper plates without making any sort of sketches beforehand. The cutout he made below was a tiara! After we relaxed on the couches of the JCPenney lounge for a while and let our stomachs rest, what did we do? We ate more burgers, of course. I’m pretty sure their “special sauce” was some version of a sriracha mayo, and it’s something I’ve recently started making quite a bit at home. A little spicy mayo can really jazz up a sandwich! At the end of the night, Rachael Ray crowned the winners of the Burger Bash, and Marc Murphy graciously accepted the Judges’ pick prize for his lamb burger! Then Pete and I went home, plopped on the couch, and concluded that we both ate WAY too much and didn’t eat enough, both at the same time (because we still wanted more delicious burger). 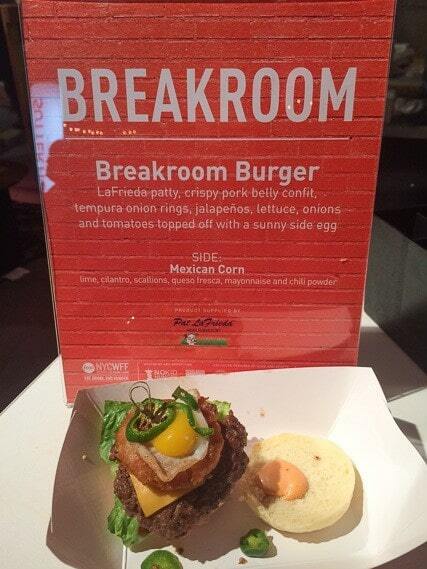 Thanks so much to JCPenney for sending me and a guest to the Burger Bash, and I hope you guys enjoyed my recap! 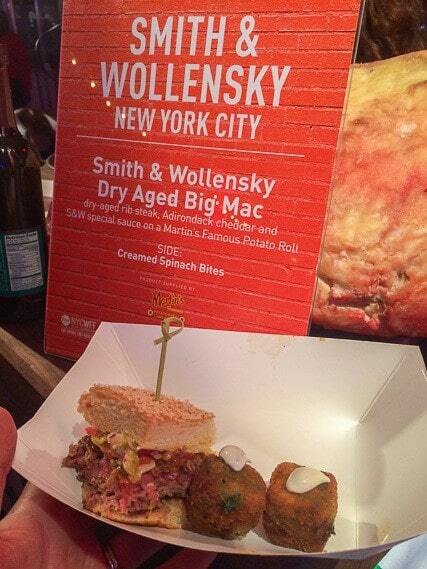 Have you ever been to the Food Network NYC Wine & Food Festival? If so, I’d love to hear your experience! Looks like a great time. Jealous of all those burgers!! It was SO much fun! It was my first year attending, too, and the walk back to Grand Central was very necessary after all that burger goodness haha! Glad you went and enjoyed it too! I thought everyone did a great job, and what a gorgeous night! 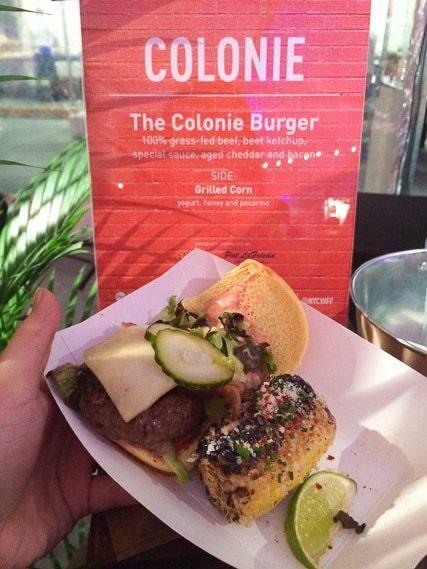 No, but would love to go…..were the hamburgers all free ? They sure looked delicious…..and you look like you were having fun with your husband…..did you come away with some ideas ? You have to pay a ticket to get in (and it’s pretty steep), but once you’re in, it’s all you can eat. We were stuffed! And yes, many ideas! 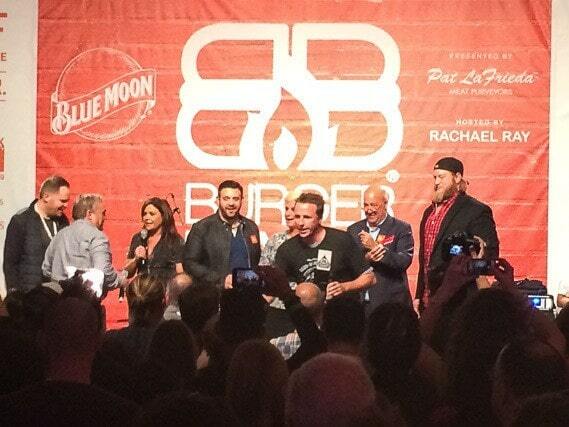 It was so inspirational…all that great food and so many great chefs! This was my fifth year going to the NYC Food & Wine! Always a fantastic weekend, although I think I gain 10 pounds . I would definitely recommend Bobby Flay’s Tequila and Tacos and Rock and Roll Sushi with Morimoto. Hi Christin, that’s pretty cool to know…I imagine you have seen the event evolve, having gone for so many years. Thanks for the recommendations with the other events!!! Will keep that in mind. Sounds like a fantastic night, wish I could have been there! Love your site!! !